First off, I you haven't noticed, I've changed the title of my blog; kind of a play on the movie title and the fact that it all takes place under a table. I felt very clever when I thought of that. More has been done on the Nemo/Organ scene, not as much I had planned, but stuff was still done. I jumped around a lot today, looking at previous scenes that I did and getting them totally signed off so I don't have to visit them again later on in a panic to finish up all the details. • The switch for the "Nemo Gun" in the Shark attack scene has been replaced with a reed switch; that way there's no physical contact which means little to no maintenance. 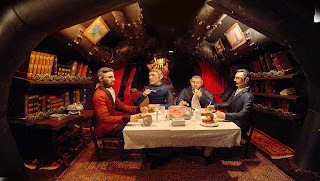 • The Dinner scene was completely finished with hands for the figures, utensils, and everything glued down. • The Shark attack scene was lowered 4 inches for more comfortable viewing perspective; it was hard on my neck to look at. • Nemo's cross in the Burial scene was painted and glued. That scene still needs it's water effect as I stole it for the Shark attack scene and I need to make another one. 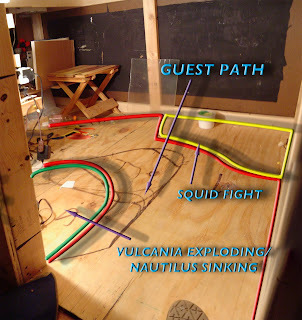 • I planned out the basics for the next scene, the fight with the giant squid. 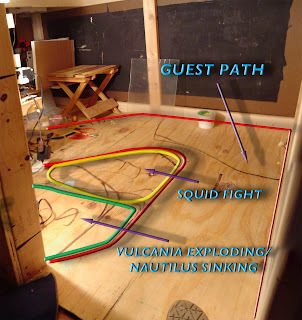 I had to adjust the crawl path in order to satisfy my need for adequate space for both that scene and the end scene with Vulcania exploding/Nautilus sinking. • More was done on the Organ scene. At this point, the organ console was painted and given a high-gloss finish. The "woodwork" was made out of sculpey and painted with Testor's gold enamel paint. (I was hoping for a larger scale so I could actually gold leaf it like the real paint, but it turned out too small for that). I still need to do the pipes, the Nemo figure, but I can't quite do those until I get more supplies. The two round piece of furniture were made out of foam that go in the foreground of the scene, all sealed and ready for paint. Here's a "press shot" of the finished dinner scene. It's a super-size image so you can see all the details. A closer look at the table details; everything you see was made from scratch, nothing store-bought. The Organ scene in progress, with the painted organ console and freshly sealed seating. The main problem with how this area works out is that the spaces for these scene are rather small, when they should be big for such spectacular scenes. I also discovered how hard it would be for some people to make that hairpin turn and being able to crank their neck to look at the scenes on that turn, especially for the squid scene. So I made some adjustments. By adding a few elements around, I was able to get a comfortable viewing perspective for both scenes, as well as gain more space for each scene. It was a win-win situation! I will be getting into the details of the Squid fight possibly in the next update, but until then, that will be it for now.